I will admit that I find some mass settings tedious, especially when the words are repeated over and over and over again. So, not being familiar with Vaughan Williams’s work (I think I had heard once the Agnus Dei in isolation), I was a bit apprehensive as the piece began. I soon found that I had nothing to fear. It is a remarkably fluid, beautiful and crisp rendering of the text. The choir’s superb control of the dynamics and diction brought out the best in the music. Now, it so happened that the friend who took me to the concert was once my Latin teacher (now retired to Vancouver). I thought this was a happy coincidence when I realised that my rudimentary Latin—along with my familiarity with the English translation of the mass parts—allowed me to follow along without constantly glancing at the programme notes. As I kept listening, I became more and more aware of how Vaughan Williams shaped the music to the meaning of the words. This was particularly striking during the Credo—the Nicene Creed that is recited at mass on Sundays and other solemnities after the homily. It is easy to fall into the trap of thinking of the Creed as merely a formula of belief: a dry list of facts about the faith. But as I listened to Vaughan Williams’s music, I was reminded that it is not only a litany of dogmas, but also a great drama. The piece starts, as is traditional, with a simple plainsong intonation, which quickly moves into a confident, Renaissance-style theme to relate the great truths about God the Father and the Son; then, in a quiet, simple and awed tone the Incarnation is pronounced, and sadly is the Passion announced. The Resurrection is set to an exultant melody, again very Renaissance in its flavour, but without being silly or bombastic. The articles on the Holy Spirit proceed in a spare, solemn but quietly joyful tone; those on the Church with a gravitas that gives way to an exuberant Amen. Thus, the whole Christian history is presented, not in the dispassionate way that (unfortunately) we often recite the Creed during the mass, but as a living story. 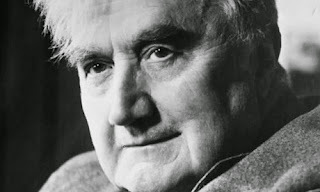 I was grateful to Ralph Vaughan Williams for helping me to see the Creed anew as the drama that it is, born of the revelation of Jesus Christ and arduously formulated by the early Church as she worked to understand what that revelation meant, under the inspiration of the Holy Spirit. How often do we dwell on this on Sunday when we say together these awesome words? It was particularly apt the next morning that the opening hymn at mass was the great “O God Beyond All Praising” to the tune of Thaxted, composed by Gustav Holst, friend of Vaughan Williams and to whom the Mass in G Minor was dedicated. With hope in God’s boundless mercy, may we one day join the two of these composers in singing his praises forever in music that will exceed even what I heard last Saturday.